The perennial leading man talks about his Irish roots, getting older, and his passion for activism. George Clooney has nothing to prove as an actor and he knows it. It’s part of what makes him such a pleasant and relaxed interview – quick with the self-effacing jokes, interested in the wider world beyond where he now sits, at home in his own skin. At 51, he is aging beautifully and has more mischief in him than people half his age. If all the charm, the intelligence, the wit and the chivalry is all an act – which after interviewing him six times by now, I don’t believe it can be – it’s a damn good one. What you see with George Timothy Clooney is what you get. Notwithstanding the fact that he hit the half century mark in May of last year, Clooney appears to be getting cooler and even more relaxed with age. Take his wheels for example; these days he’d prefer the comfort of a minivan over a sports car and his nonchalance has a way of making that cool too. The actor makes frequent and fond references to his Irish roots and his Catholic upbringing. Clooney has Irish roots on both sides of the family, but most of his green blood comes paternally. His father’s great-great-grandfather Nicholas Clooney, came from County Kilkenny. 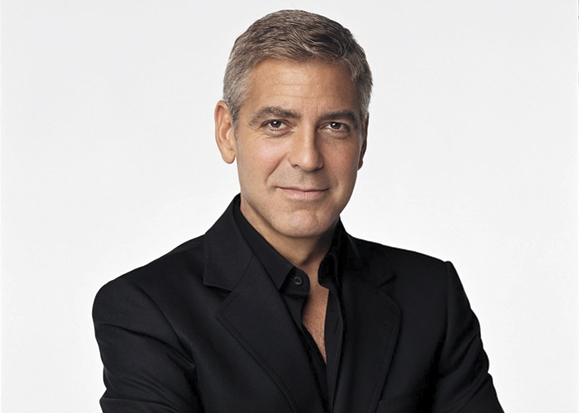 The name Clooney is an anglicized version of the Gaelic O’Cluanaigh, which translates as a descendant of Clugnach, meaning a rogue or a flatterer. His father’s mother’s maiden name, meanwhile, was Guilfoyle. Growing up the son of the well-known and respected journalist and broadcaster Nick Clooney formed much of the character which makes George Clooney the man he is today. Seeing celebrity up close through his father and his aunt Rosemary, made him recognize the traps of fame, but it also imbued in him the sense of justice and fairness which has led him to become involved in various political issues. “My father was and is a great journalist. Thirty years ago, I was studying broadcasting in college and the problem was I wasn’t nearly as good as my father. I wasn’t as quick or as smart as my old man, and I realized it would be a long time before I was ever going to be, and I decided to do something else. My uncle was Jose Ferrer the actor and he got me a part as an extra in a movie he was in. After that I got in my ’76 Monte Carlo and drove to LA to be an actor and I got lucky, quite honestly. “My parents were disappointed I didn’t finish college and they were really upset when I went to Hollywood to become an actor. I was a big disappointment to them. My father used to write me long letters for about seven or eight years, which I still have, where he used to say ‘knock this off and get a real job.’ That was the first time they felt ashamed of me. But we are really close. Currently writing, directing and producing a slew of new movies, on top of this year’s Golden Globe win for The Descendants, Clooney’s intelligence and appetite for a wide range of topics is once again on display. One of his upcoming movies is called Enron, which probably needs no explanation, and another called Hardan v Rumsfeld, whose title also says it all. His next directorial feature, The Boys from Belmont, is lighter fare about the reunion of a gang of thieves who get together to finish off a job they started seven years earlier. Using his fame as leverage for creating awareness about political issues is one of the ways in which he evens out the toll of living in the glare of publicity. His March arrest in Washington, D.C. on the grounds of the Sudanese Embassy, was a clearly planned publicity stunt to draw attention to what is happening in South Sudan. “Probably the thing I am most proud of is being involved with places and issues [and people] who might not otherwise have had their voices heard. I have all this attention on me, which I’ve been able to deflect to Darfur and South Sudan and people who could use it. The telethons and the things like that, that we’ve been able to put together, I’m proud of these things. Being able to take something that’s going well for you, and deflecting it on to other people, those are real successes. Given that he has crossed the half century mark, has he given any thought to plans for after his death? “I tried to donate my liver, but no one would take it! Imagine how disappointed I was! We have a thing in the U.S. where you check a box on your driver’s license to donate an organ. I really think it should be the other way around. I think you should automatically donate your organs because that would turn the balance of organ donation in a huge way. I would donate whatever anybody would take and I’d probably do the cremation bit. Clooney’s love life and the seeming never-ending succession of 20-something-year-old girlfriends is an endless staple of the tabloids. He quickly replaced his Italian girlfriend of two years standing, Elisabetta Canalis, with Stacey Kiebler (31), a wrestler turned model. When I try to ahem, wrestle a comment out of him about his latest flame, he pounces. Back to politics, where he’s more at home. He’s firmly backing Obama in the fall. He just used the phone and his extensive database of the powerful and wealthy to organize a fundraising dinner at his home in Studio City, Los Angeles on May 10, which raised $15 million for the re-election campaign. Just another empty headed actor who thinks he is smart. By the way, George, the “girlfriend” isn’t fooling anyone. Great actor and activist! Good luck finding your roots George! Be careful on your motorcycle, wouldn’t want to damage that perfect face! People need to stop hating on George Clooney. He is an awesome, accomplished actor w/ a highly developed social conscience. If all celebs were as level headed the world would be a much better place! So there. I don’t really know George Clooney the TV star. I don’t think I ever watched one Episode of ER, so I’m not a fan in the “heart-throb” sense. He has made interesting films. The Ides of March was probably the best from a technical point of view; the Directing was sharp and the whole film had a crispness and clarity that I haven’t seen in earlier films. His commitment to Darfur is stellar. If I were to offer an opinion on his love life. I’d have to say that he dates women of child-bearing ages, so perhaps he has not ruled out either fatherhood or marrage. Just an observation. All in all, he does seem to be a nice human being.